PPG Paints, as part of PPG Industries touches the lives of many in ways seen and unseen. As a colour pioneer we're enhancing the beauty and comfort of homes on the inside- and curb appeal on the outside. Not only are we are right at home with leading designers and builders, but we've been working with the automotive industry for years, literally our colours make vehicles move. If it's protective coatings for use in the most demanding of projects such as bridges, pipelines, marine vessels or even roller coasters PPG is up to that task too. From automotive to aerospace, building materials to consumer products, marine and industrial coatings, we're bringing innovation to the surface. Employing more than 700 people in research and development all over the world, PPG's large team of knowledge and resource allows the latest technology with the highest performance to be quickly transferred into areas across the organisation. 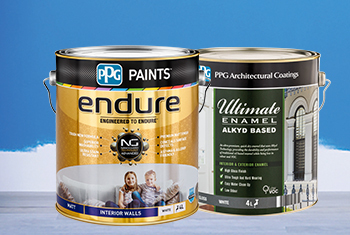 Before making it to the store shelf, PPG Paints' paints have been through a rigorous laboratory and testing procedures, ensuring they are the best quality and the most technically advanced paints available. PPG Paints aims to match superior technology, knowledge and experience to everyday customer requirements in household paint.